Objective statement: Write one or two sentences describing the type of position you are looking for. Use your objective statement to generate some interest in the reader to look closer at your resume. Skills: There are many skills that could qualify a nurse for an ICU position. Skills are often categorized into different areas such as cardiology, respiratory, neurology and others. In the skills section of the resume include skills you have that match the job criteria. Summarize your relevant abilities in bullet lists that are categorized by the type of skill set. Using bullet lists to present your skills that match those in the job description will draw the reader’s eyes. Employment history: List all previous nursing employment beginning with the most recent. For each job provide a summary of what your duties were. You should be specific when discussing what area of nursing you worked in. The best format to use will depend on your skills, experience and education. 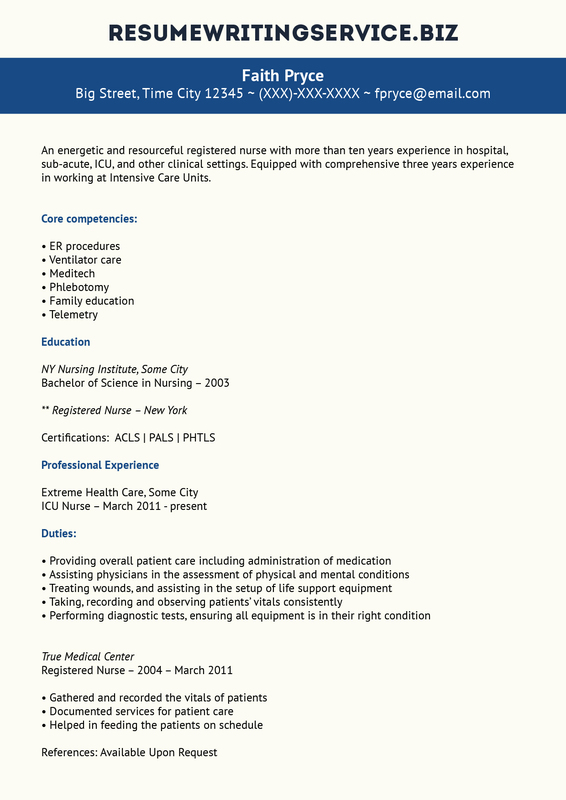 A sample ICU nurse resume can be used as a writing guide when developing your resume. Select a sample that uses a format that works the best for you and let it serve as a resume template. Same tips can be followed when writing your critical care nurse resume. Is the resume neat and professional in appearance? Is there a good balance of white space and text? Have you avoided big blocks of text and long sentences? Does the resume highlight important information using bullet lists, italics or other techniques? Is all the important information included and its accuracy verified? Is your overall goal or objective statement supported by the information you provided? Take the necessary time to do a thorough job so that the finished resume you submit will create the type of impression you want. The U.S. Bureau of Labor Statistics counts ICU nurses as part of the 2.8 million registered nurses in the U.S. so a reliable and accurate count is difficult. The median wage for a RN is $69,790 or $33.55 per hour. In general with all else being equal, an ICU nurse will earn slightly higher than most other RNs. Employment of ICU nurses is projected to grow 16 percent over the next 10 years as with RNs overall. This is above the average for all occupations. We are also eager to offer you our nurse manager resume sample. Have a look at it and use it as your guidance. Get quality help with your ICU nurse resume by getting in touch with our team!